It doesn’t take a genius to see that the national media is untrustworthy and uses manipulative tactics to get what it wants, with little consideration for the people involved; however, this was different as it was our local town newspaper. A couple of days after Abi died, we were visiting the tribute at her school and noticed someone professional-looking taking a photo of it. We asked the burser and he explained it was the local newspaper. I was surprised as I hadn’t considered they’d be involved until that point, but they’d heard of our tragic loss and had asked the school for a quote. I was told they had sent the paper a basic press release giving out minimal information, as was normal procedure. I couldn’t shake the feeling that I didn’t want to see Abi referred to in the paper in the third person, written about in a formal, impersonal way. So I phoned the paper myself. I got through to a senior journalist who was naturally pleased to talk to me, seeing as the story would now have more substance. I explained that if anything was going to be written about Abi, then I wanted to control it. Being a freelance editor myself, I know this industry well and so found it natural to want to make sure it was right, a fitting tribute to my girl. I gave a short interview on the phone there and then and sent a few photos. The next day, Abi was front page news. It’s difficult to describe what it was like to see her on the front of the local paper, to see her face on A boards in the street. But, for whatever reason, it felt right. 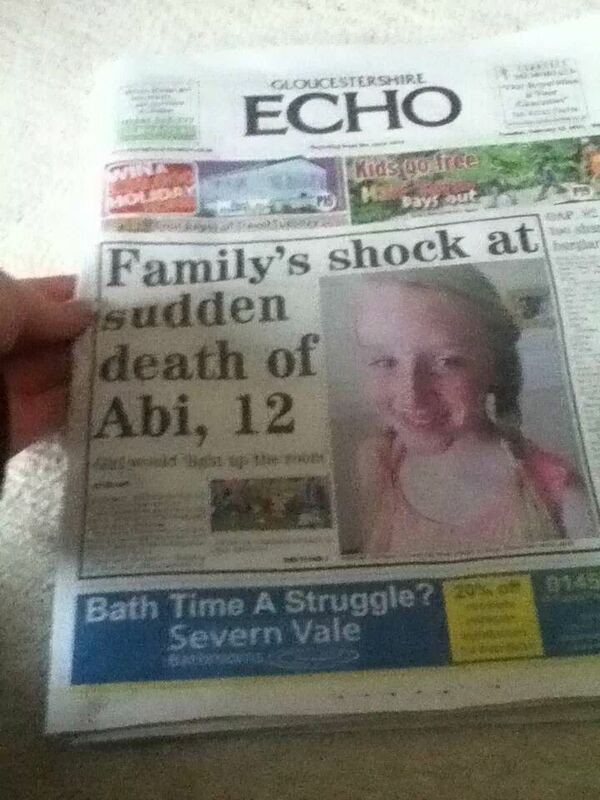 I’m not an attention seeker, far from it, but I wanted Abi’s life and death to be known about. I wanted the details to be accurate. I also saw this as a fantastic opportunity to promote our fundraising page and boost the money we could raise for Bristol Children’s Hospital. Surely it was a win-win situation? We also gave permission for the same journalist to attend Abi’s church funeral service under the proviso that he sit and observe discretely rather than actively take notes. It resulted in a fitting front page tribute to Abi that portrayed the atmosphere of that emotional day. Following on from that article, Abi’s story was covered many times, daily initially. Mostly they promoted the various fundraising events or community things done in Abi’s memory. I felt the articles really helped the wider community understand what had happened and to see the positive that can come from such tragedy. While I was sat recovering after the Bristol 10k (another story the newspaper covered), a lady came up to me. I’d never met her before, but she lived in the same county as me. She said she’d followed my story in the paper and was glad to have met me, she had lost her own daughter some years before and understood my loss but was inspired by the way the paper covered the story. It was heartwarming to hear this on what was an emotional day. I knew the story was reaching many people and in some ways helping them. For me, I suppose having a rapport with the journalist was key to the success of this. I never felt uncomfortable or worried that I would be misquoted or our privacy intruded. My years of experience in the industry enabled me to manage this with ease and whenever I felt something would make an interesting article, I felt able to let the paper know and they were always happy to cover the story. The articles have indeed helped us smash our fundraising targets and we’ve had many donations from people who have read our story and wanted to help. I appreciate not everyone wants the Press involved, these types of cases are unique and need to be handled with immense sensitivity. But our experience has been a positive one in this instance and I’m in fact thankful to flick through a folder full of articles which we and Abi’s younger siblings (including the baby who will never have even met her) will be able to read in the years to come to remind us just how impactful her passing was. The clippings are now a record of that time and are valuable family keepsakes. This entry was posted in Dealing with the media & social networks, Life with grief, Living and grieving, Remembering Abigail and tagged family, grief, lossof a child, media, press by Chasing Dragonflies. Bookmark the permalink. Thats really good to know, and I’ve seen them help your cause too recently. Our paper has faults like any other, but I’ve always given them positive feedback… they can’t hear it that often as people seem to prefer complaining. Not every press person or newspaper story is so supportive. Having two major newspapers in the Seattle area, one went more for the sensationalistic type of story when our son and his best friend were broadsided by a drunk driver and both died. It was not easy to read the stories. The larger newspaper had interviewed both sets of parents following the accident, and the story along with photo was on the front page of the Sunday newspaper, and was much better than the other paper’s stories. We didn’t know when something would be published, but saw the paper in the newsstands that Sunday and it was quite a shock to see our son and his friend staring back at us. 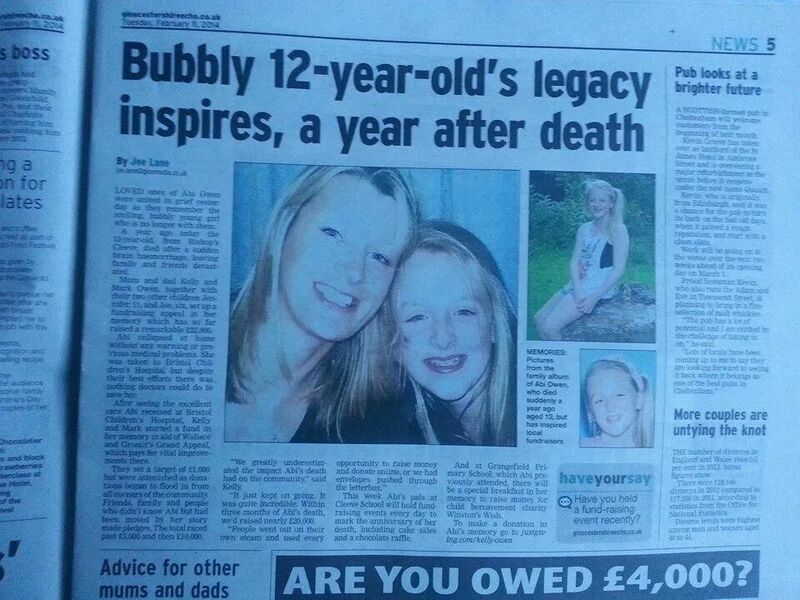 Kudos to your paper for doing something positive…and for remembering your precious girl.